Arguably one of the most dramatic railway lines in northern England, the Settle–Carlisle runs through remote, scenic regions of the Yorkshire Dales and the North Pennines. Starting from the town of Settle, it crosses the Ribblehead viaduct on its way to the Scottish border. Threatened with closure in the 1970s, it was saved by campaigners and is now an important diversionary route from the West Coast Main Line, popular with tourists and locals alike. 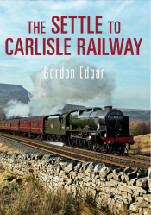 An accomplished photographer, Gordon Edgar has written several railway books for Amberley Publishing. The first, British Austerity Saddle Tanks, is part of the Railway Archive series and will be published in the spring.